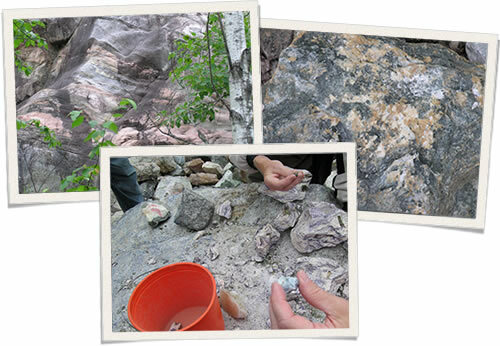 The largest gem and mineral show in Canada, the Rockhound Gemboree, is held in Bancroft Ontario every year. Bancroft is known as the “Mineral Capital of Canada” and an area with a rich geological history and mining heritage. Every August thousands of people flock to the area, from collectors to rockhounds to geologists and enthusiasts of all ages. There is something for everyone! Varying each year, around 100 +/- dealers from across the globe come to the Gemboree to showcase their gem & mineral specimens, jewelry, crafts, lapidary supplies, talent and treasures. The Rockhound Gemboree caters to both the amateur and serious rock hounder with a nice variety and assortment of attractions that it offers. The annual Rockhound Gemboree is held at the North Hastings Community Centre (103 Newkirk Blvd) and The Curling Club (63 Newkirk Blvd). Why is Bancroft known as the “Mineral Capital of Canada”? Because of the variety and quality of the mineral species found here. This area lies on part of the Canadian Shield that is estimated to be 1.1 to 1.8 billion years old. Due to the excellent quality of the mineral deposits, in the 1880 there was much mining activity. However, the mineral veins proved to be small, so the size of the mines and quarries in the area remained at a modest size. After a while, the mines and quarries closed, as they could not compete with the larger producers throughout Canada and the United States. Mining activity in the area re-commenced after World War II as the search for uranium was on. Four major uranium mines opened in the area. These were Bicroft, Faraday, Dyno and Greyhawk. These mines were open from approximately the mid 1950’s to the early 1960’s. After this time, they were closed down due to the high cost of mining such small deposits of uranium. Some other mineral species that were mined in this area are corundum, feldspar, nepheline, graphite, talc, quartz, radium, fluorite, gold, iron, lead, barite, apatite, mica, beryl, molybdenum, sodalite and marble. Interestingly, the marble mined here was of such high quality, it was used in the construction of the parliament buildings in Ottawa and Toronto. Also, many types of specimens taken from the Bancroft area can be found in museums and collections all over the world, including the Smithsonian Institute. Wondering about a certain mineral/ Click for our list of descriptions. Click here Mineral Collecting sites and information. Looking to buy something in particular? Here is our list of shops. Unique and Fantastic event in one of Canada’s most beautiful and rugged areas. Yes, that is a pity. Dogs should be allowed everywhere! I enjoy attending the rock hound Gemboree every year. There is something for everyone and many unique finds to be had. Try leaving your dog at home or a dog sitter then….